Although visible light from stars has long been providing us with the principal information about the Universe, celestial objects also emit in other electromagnetic ranges, including X-rays which have thousands times higher photon energies than visible light. X-rays are hence suited to the study of energetic astrophysical processes, including mass accretion by strong gravity, explosion due to nuclear reactions, rapid rotations of magnetized stars, and collisions among massive galaxies. The cosmic X-rays are observed with satellites orbiting around the Earth, to avoid the atmospheric attenuation. 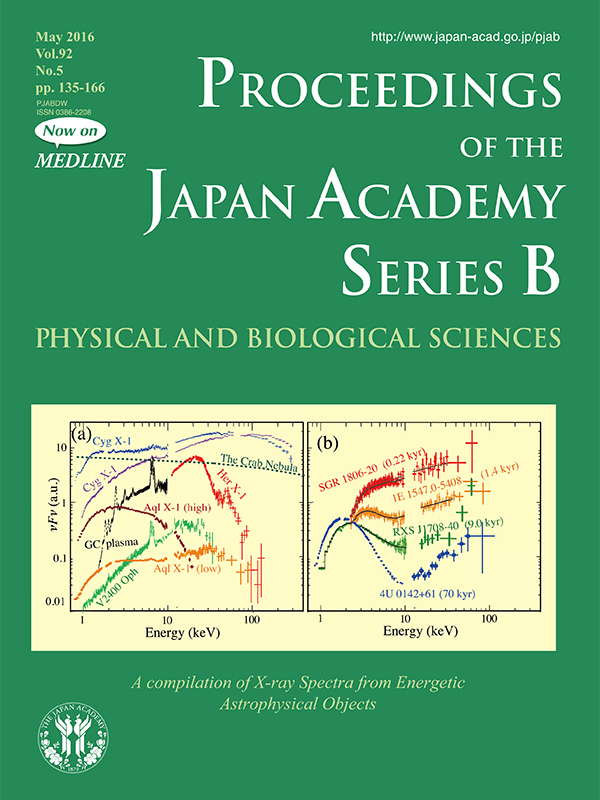 The figure shows broad-band X-ray spectra of typical cosmic X-ray sources, obtained with the Japanese X-ray satellite Suzaku (operating for 2005-2015). The shapes of these spectra, together with their time variations, tell us about types of the emitting sources, and the physical processes involved therein. 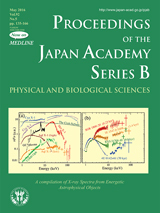 Kazuo Makishima (the author of the paper in this issue, pp. 135-155) is engaged in the instrumentation for Japanese X-ray satellites, and has been using them to study the energetic Universe. His achievements include those on neutron stars (NSs), which are the densest and fastest-rotating type of objects formed at the evolutionary endpoint of massive stars. Panel (a) includes three different types of NSs (the Crab Nebula, Aql X-1, and Her X-1). Of them, Her X-1 is a magnetized NS capturing matter from its companion star, and the dip at 35 keV in its spectrum is due to electron cyclotron resonance in a magnetic field of 3×108 T. These features have been observed from about 20 NSs, of which more than half are contributed by Makishima and his colleagues. From these measurements, he showed that the magnetic field strengths of this NS subclass are clustered in a narrow range of (1-7)×108 T, and proposes that the NS magnetism is a manifestation of ferromagnetism in the dense nuclear matter. This conjecture, though yet to be assessed, contrasts with the previous view which attributes the magnetism to some electric currents flowing inside the NSs. Another important achievement by Makishima is on magnetars, a special subclass of NSs considered to have even stronger magnetic fields of 1010-11 T. Makishima and his collaborators have revealed that the magnetars’ spectra, shown in Panel (b), consist ubiquitously of two (soft and hard) components, unlike most of the other X-ray sources shown in Panel (a). Since the hard component of magnetars has too hard a slope to be explained by conventional physical processes, Makishima and his co-workers propose an alternative explanation in terms of some exotic processes in quantum electrodynamics. In addition, Makishima has recently found interesting observational evidence that a few magnetars show wobbling in their rotation, and attributes the effect to prolate deformation of the NSs due to ultra-strong (~1012 T) magnetic fields hidden inside them. These new results are expected to reinforce the nature of magnetars as magnetically-driven NSs.